In the Triangle, spinach can be grown in either the spring or fall, but since this leafy vegetable bolts easily in warm weather, the best time to plant seeds is the first two weeks of August when the cooling winds of autumn, while not yet felt, are on their way. Like all leafy vegetables, spinach thrives on nitrogen. Since summer plants have robbed much of the nitrogen from the garden’s soil, the growing site should be refurbished with either a quick jolt of 8-8-8 or 10-10-10, or, even better, an application of time-release fertilizer that is high in nitrogen. While adding fertilizer, because spinach can be sensitive to soil with a low pH, it probably wouldn’t be a bad idea to also mix in a little bit of lime. This is especially true if you live in an area that is prone to having high-acid soil, such as what is typically found in local clay soils. And just what variety should you grow? ‘Bloomsdale Long-Standing’ is a tried-and-true selection, and its seeds can be found in most garden shops. Also consider ‘Renegade’, a high-yielding, disease-resistant choice; ‘Melody’, an early-maturing (42 days) All-America Winner; or ‘Teton’, another garden-tested, dependable spinach. Liberally sow seeds a half inch deep in rows 12 inches apart. If you garden in beds, simply scatter out seeds, paying attention to properly sow the corners and edges of the bed. When the seedlings appear, thin them to about six inches apart. Use scissors to reduce the seedlings because pulling out young plants could disturb the roots of the crop-to-be. Since it is fast growing, spinach needs plenty of water, so keep the hose handy if the rains don’t come. Also, mulch will help preserve ground water and prevent weeds from getting footholds in the spinach patch. You don’t have to be in a hurry to harvest your spinach before the first frosts because these hardy plants can withstand temperatures down to 20°F. Actually, a slight dusting of frost helps to sweeten the leaves. When spinach leaves are large enough to pick, pick them often. Go for the older, outer leaves first. If you opt for smooth-leaf varieties, you will find them easier to wash and prepare for a meal than the crinkled cultivars that have plenty of nooks and crannies for dirt, dust and unwanted insects to dwell. 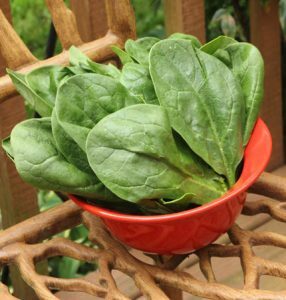 Spinach is a vegetable that is hardy enough in this area to be productive into the early winter, nutritious enough to be served several times a week, and tasty enough to be eaten raw. Enough! Gardeners, plant your spinach.